Q Acoustics announces M7 2.1-speaker system | What Hi-Fi? 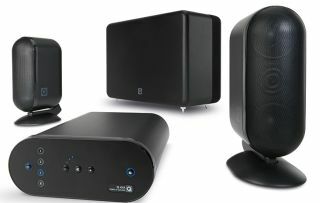 The M7 (formerly Media 7000) borrows components from the Q7000i speaker package, but comes with a new amplifier which can be used for music and movies. The new amplifier is Q Acoustics’ own Q-AVA stereo amp with a built-in DAC. It features two optical digital inputs, alongside one analogue input, plus Bluetooth for wireless streaming. The 7000i satellites and 7070Si subwoofer from the company’s award-winning style speaker package have been used to accompany the new amp. The satellites each feature two 75mm ultra long throw mid//bass drivers and a 25mm tweeter, and sport an integrated, adjustable stand allowing them to be wall or ceiling mounted. The subwoofer meanwhile has an 8in high excursion bass driver. Q Acoustics says sound the system aims to disperse sound evenly throughout the room through grilles on the top and bottom. The Q Acoustics M7 package will be available from May 2016, in black or white, for £800. If you’re visiting the Bristol Show this year, you’ll be able to hear it in the Q Acoustic room.